The just-opened hotel has a restaurant, European-inspired cafe, intimate bar and rooftop lounge. 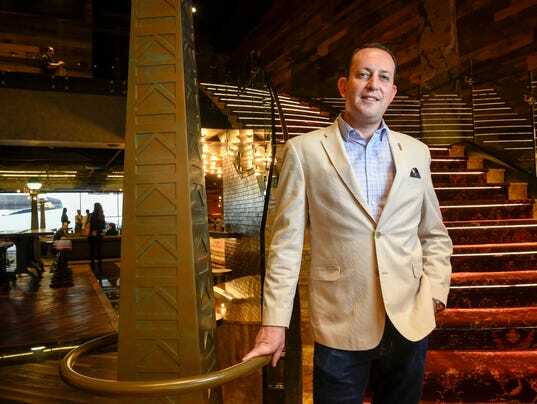 Avi Niego, general manager of the Bobby Hotel, stands on the stairs of the new hotel in Nashville on Monday, April 23, 2018. The Bobby Hotel, a 144-room boutique property with an “edgy but chic” design, is bringing a major food and drink component to downtown Nashville’s dining scene. 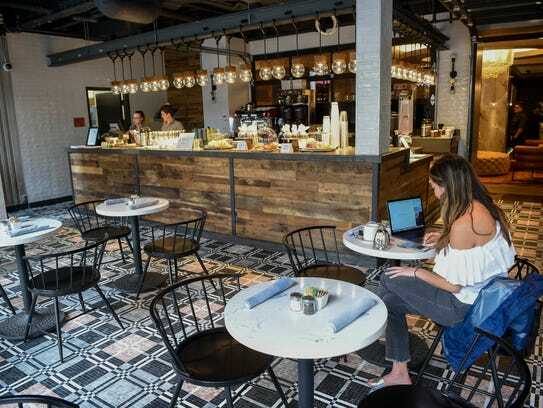 The just-opened hotel at 230 Fourth Ave. N. has four bars/restaurants, making it a dining destination along with a new lodging option in the city’s booming tourist market. Rooms start at $249 a night. Bobby Hotel opens during a time of tremendous growth in Nashville’s hotel industry. At least four other boutique hotels have opened downtown this year alone, adding 751 new rooms and nine food and beverage options. The Westin Nashville owner Castlerock Asset Management developed the much-smaller Bobby Hotel. The hotel’s edgy design was influenced by a persona called “Bobby” that has traveled the world and settled in Nashville. Walking into Bobby Hotel, guests are greeted by Sasha, a 2-year-old rescued shepherd mix who serves as the hotel’s “canine ambassador.” The hotel is dog friendly and even has dog treats in the mini bar area and pet offerings on the room service menu. Since the hotel opened Friday, general manager Avi Niego said it has been busier than expected with a mix of tourists staying overnight and locals dining at the restaurant and cafe. The hotel’s main restaurant has an extensive breakfast, lunch and dinner menu that blends elements of American and culturally inspired cuisines. Signature dishes include savory braised rabbit for $25, milk stout short ribs for $28 and sorghum rubbed pork chop for $27. The beverage program includes classic cocktails, wine and beer. The space, which can seat up to 100 people, features vintage brown leather banquettes, trumpet chandeliers and salvaged subway signs. The street-level, European-inspired cafe features garage doors that open to a 36-seat outdoor patio that is pet friendly. Diners can order at the counter or sit down for table service and enjoy breakfast, lunch and dinner. Menu options include croque monsieur for $13, quiche lorraine for $14; avocado toast for $11; tuna nicoise for $17; poulet roti for $23; and fresh pastries from Nashville baker Sam Tucker of Village Bakery and Provisions. Hours: Open daily from 6:30 a.m. to 9 p.m. Unique design elements at this garage-inspired bar include chairs converted from oil cans, lamps made from gas pumps and graffiti ceramic bathroom tiles. The drinks menu focuses on whiskey and beer. A simple food menu includes fried bologna for $11, pimento cheese for $10 and serrano and bacon fat popcorn for $6. 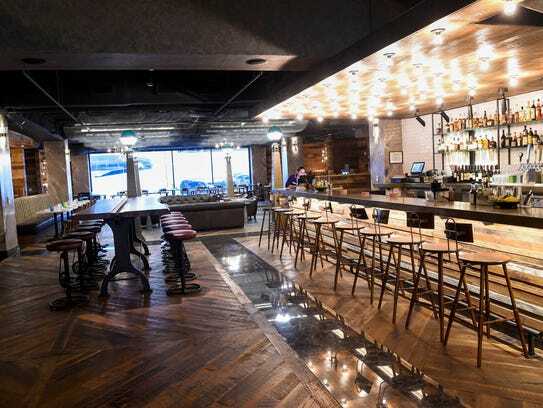 The bar, which is slated to open later this week, is connected via a stairwell to the Tavern at Bobby and also has its own entrance off Printers Alley. Bobby Hotel’s rooftop lounge will debut once the weather cooperates, and will feature a dipping pool and cabanas. A 1956 Scenicruiser bus was repurposed and hoisted onto the hotel’s roof. Signature cocktails cost $13-$14, and the food menu includes street tacos, bibb lettuce salad, shishito peppers and stuffed jalapenos. Let us share your good news! Send in your story to LMcGuire@PNTax.com.